PHOTO: The Hamburg Waterfront is alive again thanks to the rebirth of Elbe River shipping. (courtesy of Hamburg Tourism). Hamburg, which enjoyed a great year out of the U.S. in 2013, is doubling down on the market with a new online travel agent training program. The Hamburg Tourist Board (HTB) hopes to enroll 1,000 agents on www.happygohamburg.com so that they are better prepared to sell a city that is rising quickly among tourists. 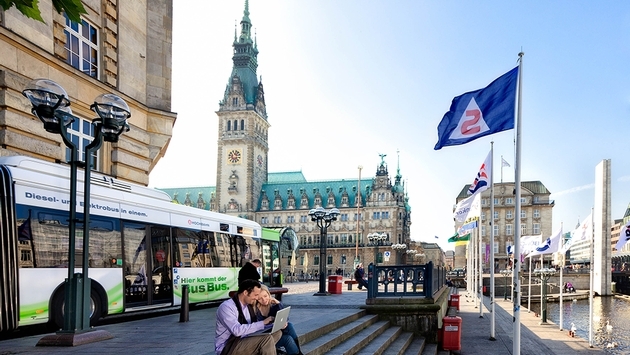 Hamburg is the first city in Germany to launch an online agent training program. The free training program is divided into four courses: neighborhoods, culture, lifestyle, and excursions. Agents that complete the program will receive a “Hamburg Specialist” certification.” Additionally, those taking the specialist program in 2014 will have the chance to win a five-day trip for two to Hamburg. Between January and September, U.S. overnights in Hamburg rose by 15.4 percent to 137,729. With its occupancy rates continuing to climb over the last several years, Hamburg has been adding rooms to meet the demand. Between this year and last year, the city is adding 11 hotels and 1,748 rooms and 3,486 beds. Already Germany’s second largest city and Europe’s third largest port, last year Hamburg’s status as a leisure cruise port grew, when some 173 cruise ships called carrying 500,000 passengers. The city’s fortunes changed dramatically with the unification of Germany in 1989 because the Elbe River, the former East Germany’s main riverine artery, once again became reachable from the sea via Hamburg. Before the Wall went up, Hamburg was the Elbe’s major hub for ships moving goods into Eastern Europe. Topographically, Hamburg is also on the maritime seam between the Jutland Peninsula to the north and Continental Europe. Hamburg’s harbor is getting a major makeover in the HafenCity project, Europe’s largest inner city development plan, which is transforming its waterfront and attracting more attention from the cruise industry. The city, which already hosts Europe's biggest public cruise event, the Hamburg Cruise Days, will in 2015 begin hosting Europe's top cruise trade show, Seatrade Europe. Scheduled for total completion in 2025, HafenCity will introduce new apartments, cultural venues, restaurants and shopping into the area directly across the Elbe from the port. The development on 157 waterfront hectares, will increase the size of Hamburg's city center by 40 percent. In 2017, the Hamburg Elbe Philharmonic Hall is scheduled, after many delays and cost over-runs, to open on the western edge of HafenCity. The spiritual heart of the city right now is the Speicherstadt, an area that features long rows of spectral warehouses built in the 1880s by Neo-Gothic architects using red brick, the favorite material of buildings in the Hanseatic cities. The warehouses have been listed as a UNESCO World Heritage Site. Historically, Hamburg has always been something of a city-state, operating within Germany but separately, just as Hong Kong used to operate separately within China. Generations of sailors and longshoremen created another cottage industry in Hamburg’s St. Pauli district along a strip known as the Reeperbahn, a Red Light district that became internationally famous when the Beatles began playing at Indra, a music club on the Reeperbahn. Over the following two and a half years, the band played 281 gigs in Germany, launching their career on the Reeperbahn. Hamburg’s BEATLEMANIA museum has five floors devoted to the Fab Four.